I'm sitting at my desk at the language center, looking out a deceptively sunny cityscape. Unlike the past week, the sun is shining brightly and warming everything in it's path. Just like the past week, however, the temperature is somewhere between the mid 30's and the mid 40's with a stiff cold wind. When I asked my middle school students two weeks ago what time of year it gets cold in Wenzhou, every one of them said (emphatically) "It doesn't get cold in Wenzhou! It's warm all year!" According to my research, the students are mistaken- it gets cold in Wenzhou at the beginning of January. Over the past few weeks, I've taken a few panoramic pictures of our neighborhood. To complement the view from our front door, this is the view of our front door- it's on the top floor, in the middle along the far wall. This is looking east at night from the window in the 8th floor by our elevator. This is what we see when we look out our dining room window during the morning. The dining room shares the same exterior wall as the kitchen, so this is also the view we have when we're washing dishes. 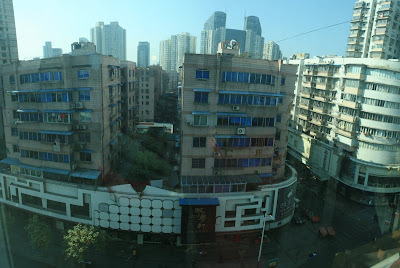 This is the street that runs past the west side of our apartment- our dining room window is located in the middle of the picture, underneath the horizontal red neon characters - it's the top floor on this side of the building. This picture was taken from an overhead "pedestrian circle/crosswalk" at a traffic intersection. Moving from left to right, the first few buildings are apartments, the building with the vertical neon characters is a restaurant, next is an apartment building, then the vertical green lights (I don't remember what that building is), then there is a building with stair-step dark windows on a light tile exterior- that's our apartment building. Next to that is a nondescript light-colored building (another set of apartments), then a building with a diagonal grid of lights-a kareoke bar-followed by a building with a row of round lights, which is another kareoke bar. You can't see the street level very well in the picture, but there are three bread shops, a music store, two electric appliace stores, a few small restaurants, and many small clothing shops on this section of street. We live in a busy neighborhood. This intersection is a short (5-7 minute) walk from our apartment. If you zoom in far enough, you might make out on the left-hand side of the opposite corner (the North-West corner) the emblem of an internationally-acclaimed American tourist rendezvous point- a solid red circle emblazoned with two golden arches. It's our neighborhood McDonald's! On the right-hand (North-East) corner is a mid-to-upscale clothing store (Kai Tai), with a drugstore in the basement. Farther to the right, out of the picture, is the South-East corner with a typical small shop/Apartment building. Behind me on the South-West corner is the International Hotel, a upper-end clothing mall, and an underground Pizza Hut. This is the Pizza Hut. The fact that it's in a basement is surprisingly non-evident. A bit farther east (Another 20-25 minutes by foot) is Europe City. Europe City is home to an upscale clothing mall, a mid-scale clothing mall, McDonald's, Pizza Hut, Papa John's, Trust-Mart,* several other restaurants, and an import grocery store. This is a picture at Europe City from outside the mid-scale shopping mall. You can see the Pizza Hut in the lower left-hand corner. The towers in the center are on the up-scale shopping mall. Directly behind me is the new Papa John's. It's delicious. * Trust-Mart is a Chinese affiliate of Wal-Mart. They carry a few of the Wal-Mart house brands, such as GreatValue and Mainstays.